AMERICAN luger Emily Sweeney crashed out of the PyeongChang Olympics on Tuesday, losing control of her sled midway through the final run of the competition. She was able to walk toward the finish about 10 minutes after the crash, albeit very gingerly and with some assistance from team and on-site medical personnel. A source from USA Luge confirmed to NBC Connecticut that though Sweeney is very sore, she does not have any broken bones. 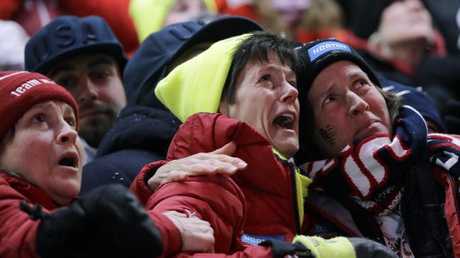 Sue Sweeney, centre, the mother of Emily Sweeney of the United States, cries out as her daughter crashes on the final run during the women's luge final. It took several minutes for Sweeney to get to her feet, then several more before she could finally start a slow walk to the finish area - surrounded by team and on-site medical personnel. These were the first Olympics for Sweeney. Later in the final run, Summer Britcher of the United States lost control at the start and collided with some walls - but got down the track without crashing or incurring serious injury.